Having a pet is one of the most rewarding experiences. They’re basically family, which is why you’ll do anything to take good care of them. But they’re also responsible for a quarter of all greenhouse gases, with pet food production alone emitting 64 million tons of carbon dioxide in the United States annually. From pet chow to cat litter to plastic doggie poop bags, our pets create a lot of waste, but there are eco-friendly pet products on the market—and ones you can make at home—to reduce your impact. Over 150,000 tons of cat litter makes its way into U.S. landfills each year. If your indoor cats have been tested for toxoplasmosis, you may be able to switch to commercial flushable cat litter made of corn, wheat, or sawdust and pine. Test a small amount in your toilet first to see how your pipes handles the litter, and let a little litter dissolve in the bowl before flushing to avoid clogs. For dog owners, disposing of waste often means throwing little plastic baggies of dog poop into the trash—and those “green” waste bags may not be as biodegradable as you think. In a landfill, piled under other garbage, there’s often not enough oxygen to break that plastic down—even if it is labeled “biodegradable.” Look into brands that use recycled resources, like Poop Bags, or are flushable, like Flush Puppies, which are made with water-soluble polyvinyl alcohol specifically meant for flushing (provided your pipes are up to the task). Whatever you do, don’t leave your pet’s waste on the ground—rain can wash it into the waterways where it can cause contamination, or an unlucky neighbor can step it, starting a circle of karma you definitely don’t want to be a part of. See if there’s a composting facility or service nearby that offers pet waste collection services, such as the Green Pet Companies in Washington and Oregon. You’ll pay an extra fee to do so, but if there’s an option in your area, the company will likely provide the compost bin and handle the pickup. Treats, chews, and bones can be fairly unsustainable to produce and made with questionable, unpronounceable ingredients. For example, some rawhides made outside of the U.S. are bathed in chemicals to prevent spoilage and can be tainted with arsenic or formaldehyde. Luckily, there’s better options available. For your dog, check out No-Hide Chews, made with high-grade, human-quality ingredients. Another eco-friendly chow option is to boost protein intake with crickets. Jiminy’s dog treats require less resources than traditional dog treats, the production process emit very little greenhouse gases, and cricket is higher in protein per grams than protein from cows or chickens. And you can make treats yourself, even if you don’t have a knack for baking. Check out these easy baked recipes from the American Kennel Club for your pooch. If you don’t feel like turning on the oven, this no-bake recipe from Crayons and Collars incorporates pumpkin and peanut butter without the fuss. Homemade treats are usually cheaper to boot – but check with your vet first before making any dietary changes. The methane and nitrous oxide created by pet food is equal to that of 13.6 million cars. Combat that by opting for more sustainable brands. Only Natural Pet uses free-range meat and GMO-free produce. It’s an eco-friendly company itself, meaning it composts and offers carbon neutral shipping, plus the facilities use 100 percent renewable energy. For cats, Newman’s Own Organics Premium Cat Food is minimally processed and most ingredients are free of harmful pesticides, hormones, antibiotics, and GMOs. If you get the go-ahead from your vet, you can also incorporate unused animal parts from your own meals into your pet’s bowl. Love chicken but not a huge fan of the gizzard? Instead of tossing it, feed it to your pup. And in a pinch, avoid canned food for your dog—it’s better for the environment (and your pup!) to feed them scrambled eggs over highly processed canned foods. Even old toys can be repurposed. “Instead of adding to the landfills, you can see if anyone needs any pet accessories or apparel,” says Lori Askins, a representative for pet company Ruff ‘N Ruffus. “More than likely, there is a shelter that would greatly appreciate your donation." Be sure to only donate clean toys in good condition though, to avoid your donation being dumped for fear of contamination. Create new toys out of repurposed household items. Braid together an old cut-up tee shirt for a tug of war challenge your dog will love. A good option for cat lovers is to make a spider cat toy out of old shredded fabric and a hair tie. 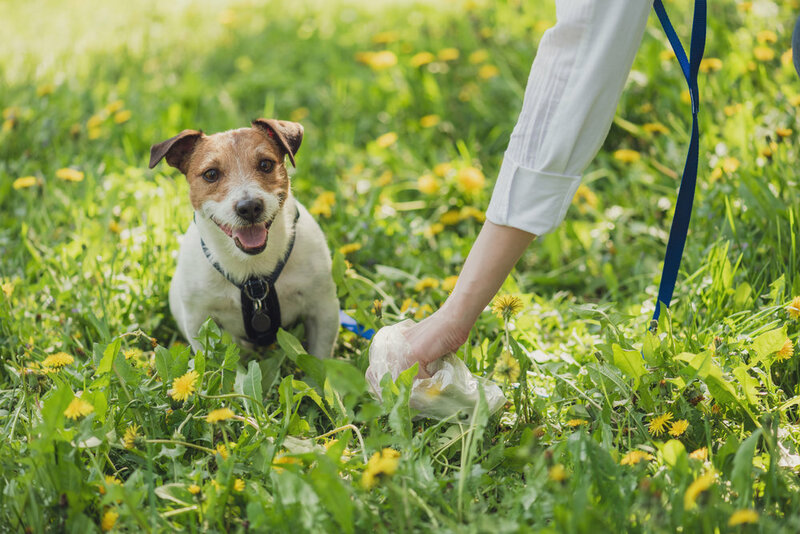 Instead of contributing to landfill waste by using baby wipes to clean your pet’s paws of any outdoor allergens and to avoid dirt stains, check in your closet for a greener solution. Old rags or washcloths, rather than disposable wipes, offer a more sustainable—and money-saving—solution. Dampen them with water and pet-friendly, hypoallergenic soap, then toss them in the hamper afterward. You can also find reusable paw cleaners you can throw in the dishwasher and use again and again, or purchase soft and reusable shammies that absorb tons of water. It might take a little more effort to think outside the box and incorporate eco-friendly habits around your pets, but focusing on small shifts in habits can add up to a big impact. Help your best friend be a good friend to the planet.